By now, everyone should know that we are hopheads. The rare breed of beer drinker that likes their brew more bitter than a North East Ohio winter and with more hops than the king, LeBron James. Our bitter beer faces are all smiles. With a new year brings new challenges, you know, remembering to write an 09 instead of an 08 on the rent check. It also brings us to our first challenge of the year: The battle of the IPA's. Since we wanted to start out the new year strong, today we sample two of our favorite IPA's for yet another blind taste test: Weyerbacher Double Simcoe IPA and Dogfish Head 90 Minute IPA. Both IPA's are double hopped and have a 9%ABV but the Double Simcoe is bottle fermented. This poses a problem: How do we keep this a blind tasting when one has yeast floating in the bottle? Simple. Turn off all lights-- after all this is a blind tasting. To help keep things fair today is Mr. Johnny V.
Fist Brew: The start is not as strong as one would expect from the style but we are okay with that. It has a unique taste that somehow still adheres the the IPA formula. The brew finishes well with an obviously high ABV but not as bitter as we would have hoped. This delicious brew seems to lack something we can't put our finger on, but it sure as hell gets two thumbs up anyway. 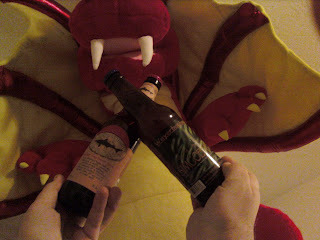 It was later revealed to us that the Dogfish Head lead off our tasting followed by the Weyerbacher. I guess the rare simcoe hops seem to have our a-card. If you are a hop enthusiast, we recommend trying both these delectable brews on your search for the perfect IPA. In conjunction with this review, Blood of Christ Winery has added both of these brews on tap.